One of the hardest things about infrastructure planning in the web-enabled world is estimating capacity needs, especially from a network perspective. Having a piece of content go viral can mean the difference between having a functioning set of web infrastructure and a completely broken one. But how to avoid this potential catastrophe? 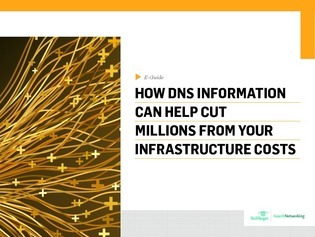 This expert e-guide explains why DNS intelligence is the key to better network capacity planning and dynamic resourcing. Access now to begin planning to cut your infrastructure costs dramatically in the coming years.